First, the good news. 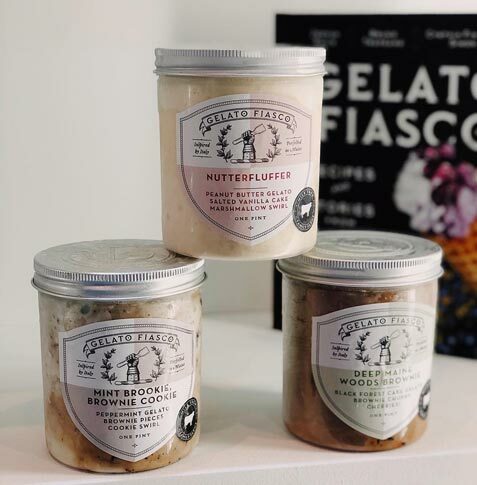 Our old pal Nick is responsible for three of the new flavors coming out of Gelato Fiasco! How's that for awesome. The flavors have been popping up on instagram. Deep Maine Woods Brownie replaces the rookie Deep Maine Woods. (peanut butter and marshmallow for you non-regional people). Mint Brookie, Brownie Cookie is just for fun. And now the bad news. Talenti has announced their 2019 lineup.... and it's BORING. Oh boy, 4 organic flavors and another (potentially GI troubling) less sugar flavor. Be still my beating heart. Lemon Bar is the new less sugar flavor, and the organic ones are brown butter caramel, chocolate mousse, ginger matcha, and oak-aged vanilla. Look, I love classic flavors, but really? That's the best you can do? I guess ginger match is out there for them, but at least throw us one crazy flavor. Since Talenti likes to stick to 40 flavors, that means we lose chocolate chip, simply strawberry, chocolate sorbetto, cinnamon peach biscuit, and chocolate caramel blondie. (I spied toasted almond as limited last year but it's not on this year's or last year's flavor list). The funny thing is that I've seen stores clearancing Talenti flavors besides these five. In particular, almost every store I've seen has wiped out the less sugar vanilla cinnamon flavor. Update: I saw tags put out for the new Talenti Layers lineup. There seem to be four flavors and each flavor has 5 layers. We should be seeing them soon! March Update: People have started spying these flavors and there are in fact seven of them in all! Technically Dove has released some new salted caramel, chocolate dipped Gelato bars as well. I have no idea why because their lineup is so small, you wouldn't think there would be room for this random treat. Ok, that's all I got for now! YAY NICK! All 3 new regular flavors sound great to me! Especially the mint, that’s right up my alley. I can’t believe they decided to axe chocolate carmel blondie? None of the new flavors appeal to me but I’m most likely to try the oak aged vanilla. I expect backlash for this comment, but...I really don’t care one bit whether my ice cream is organic or not. The organic label never encourages me to make any specific junk food purchase. If I want ice cream (or cookies, chips, whatever) I’m just buying what I like regardless of what healthy label they slap on it. Oh man, come back to us Talenti. I wonder if the organic flavors will be more expensive, like most organic stuff is. I'll probably give at least the brown butter one a shot, but I agree with you completely. I don't know much about Nick's connections--how did he get to be a flavor influencer? On the subject of Talenti...is it now considered "higher end" than B and J? I thought B and J was the "top" of the Unilevel products but consistently see Talenti for $1-2 more. I know B and J has gone downhill (general opinion and I agree) but I never thought Talenti was so exceptional either...honestly, these days I don't see much difference between the few Breyers that are still ice cream (vs FDD) and the "fancier brands" (admittedly, I do not pay for the super fancy brands so I cannot compare those). Ever since Talenti got bought out (by Lever? ), they've gone downhill. @ibagoalie: right, the pre-Unilver years showed higher quality but less distribution. They moved to a new plant and then slowly cut corners as they grew to the multi-shelf brand they are now. Once upon a time, you had to search high and low for Talenti only to find 3 or 4 flavors. I have been consistently disappointed with Talenti, but I realize that is because I never was able to experience the brand pre-Unilver buyout. Every pint I have had has had a grainy consistency, not creamy like I would expect from a gelato. Gelato Fiasco on the other hand looks like it could be amazing this year! Dubba, do you know if Talenti has discontinued their Chocolate Chip? None of my regular stores have carried it for quite some time. I know they were discontinuing flavors to make room for new one but I really hope Chocolate Chip wasn't a casualty. Actually, the first Talenti flavor I ever bought (pre-Unilever) was their Tahitian vanilla bean. I tried it because Nick gave it such a glowing review, and he was right - it was superb! It was one of my favorites for a while. If you're reading this, thanks Nick! (Sorry we have the same name...confusing). I guess I should try GF's vanilla, since he clearly knows his stuff. Weird that I remember that, I know, but it's why I visit this site! @Anon: sorry, I have corrected the post, I meant to note that chocolate chip was one of the main five that got cut this year. 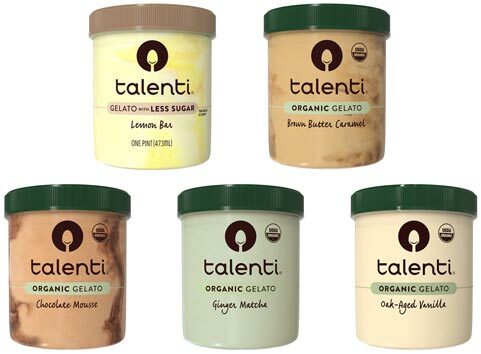 Talenti’s quality has definitely gone down and yeah these flavors do look boring. The chocolate mousse and caramel ones sound good, but I have also been bummed lately with Talenti’s quality. I found the Talenti (minus the lemon low sugar variety) at Sprouts. I tried all of them but the matcha flavor. The oak adds an interesting complexity to the vanilla. The chocolate and the caramel both have nice flavor, as well. I think they did a good job with them (better than some of the other recent Talenti flavors). Tillamook has a new blood orange and cream flavor, a chocolate cherry, and a birthday cake. They are all pretty good. I think I like the blood orange best. They also have a Banana foster custard, which is quite good.